Power lacing is a technique that will keep your shoes comfortable, stable, and tight. You probably thought shoe-lacing was just criss-cross, then either bunny-through-the-hole or double-bunny-ears, and you’re done. But no! Leave it to runners to come up with a slightly more complex but ingeniously better way to keep feet in shoes and shoes pounding pavement. I like my shoes to be one with my feet. No heel rubbing, and no lateral or vertical movement for this girl! I wear orthodics, which raise my heels a bit. Therefore, if I don't power lace I feel like my feet are about to come out of my shoes. 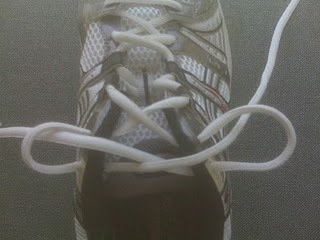 The power lacing technique is simple and easy to do, and makes a huge difference. Watch the video below to see the magic. You'll never normally lace again! Weekend Report: Chix Gets Married! Weekend Report: Happy 4th of July!